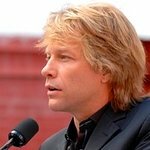 Jon Bon Jovi has revealed how he was inspired to establish the Jon Bon Jovi Soul Foundation, the charity he set up in 2006 to combat issues that force families and individuals into economic despair. Bon Jovi named the Foundation after the arena football team he co-owns – the Philadelphia Soul – and uses it to fund and create of programs and partnerships to support innovative community efforts to break the cycle of poverty and homelessness. Their goal is to recognize and maximize the human potential of those affected by poverty and homelessness, and provide affordable housing, social services, and job training programs. Ever since he bought the team, Bon Jovi’s intention was to ensure that the Soul was different from other sports franchises – everything the Soul does includes a charitable component, it is the cornerstone of the team’s identity. All members of the team are encouraged to be positive role models for children (players, dance team members and the team mascot regularly make public appearances at non-profit and charity events, schools and hospitals), and even the fans do their part to make a difference – from donating teddy bears to abused children, to giving school supplies to Katrina-ravaged towns, and even supplying backpacks to needy children in Philadelphia. To find out more about the Foundation, visit their website.